My daughter loves muffins with surprises inside, so this recipe is for her. Who doesn’t like a surprise? I already have my Nutella Filled Banana Muffins on the blog. 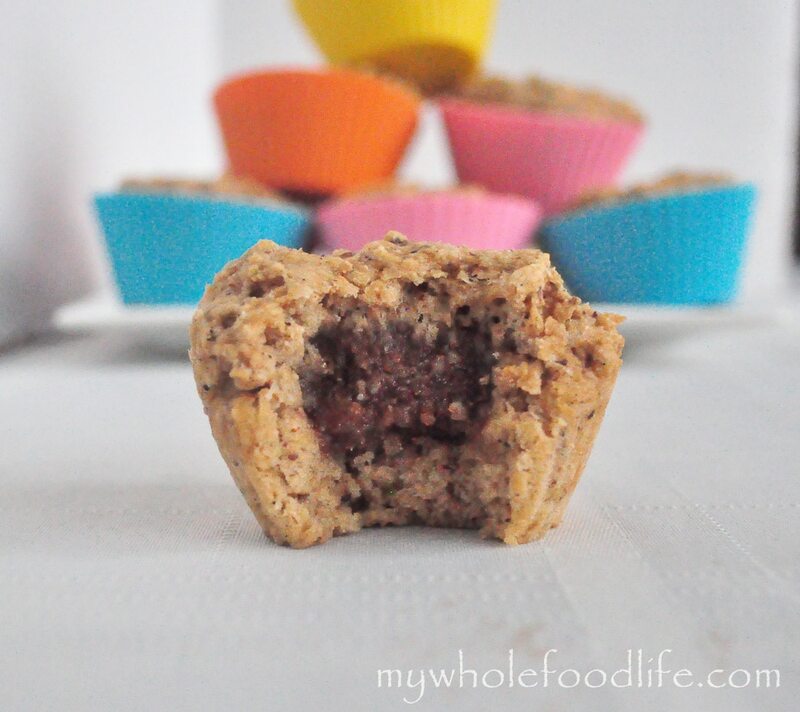 These muffins contain a sweet little surprise, but they are made with wholesome ingredients. If you like my Pecan Pie Larabars, you will love these! This is a great one to make with your kids. I let my daughter put the filling into each muffin. It was fun to be able to let her help me bake. muffin pans. I used standard sized muffin pans . Take some of the pecan mixture and roll it into a ball. Place it on top of the muffin batter. Cover the top with more batter. Bake in the oven for about 13 minutes or until a toothpick comes out clean. I got 12 standard sized muffins and 1 jumbo muffin out of my batch. These should last 2 weeks in the fridge, but you can freeze them for longer storage. Melissa! Wow! These sound outrageously fabulous! I am totally in agreement with your daughter - I love surprises in muffins. Plus, I adore pecan pie. I absolutely can't wait to try these! Seeing this new recipe post was a great way to wake up on a Saturday morning! Thanks bunches! My pleasure! I hope you enjoy them! I am loving anything and everything pecan related at the moment. Me too! I hope you enjoy these! These sound amazing but I have trouble getting my kids to eat baked goods made with whole wheat flour because of its density. Can you suggest an alternative that is still healthy? I really hate to use all purpose. I think it's something that you have to get used to. You could try doing 1/2 all purpose and 1/2 white whole wheat. Just made these. Turned out pretty good! I had a tough time with the food processor though.. some dates just stayed chunky. Oh well!